Food prices, along with everything else, are skyrocketing. I just saw that it costs almost $6.50 for four sticks of organic butter at the food store! I can't help but think there's got to be a better way, especially in light of all I have read in Surviving Off Off-Grid: Decolonizing the Industrial Mind. The more I learn about the past and frugal living though, the more I realize how ignorant and how little I know! So this week I took the girls on a field trip to Fosterfields Living Farm in Morris, NJ where they churned up some real organic butter that cost nothing but a little bit of work! Fosterfields Living Historical Farm is a 200-acre National Register Historic Site demonstrating farm life as it was 100 years ago. It is complete with farm animals, crops, period furnishings, and machinery from the turn of the 20th century. The girls had a blast and we had a refreshing insight into the way things used to be. 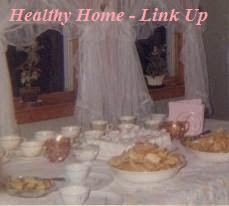 I follow the blog "Raising Homemakers" and really enjoyed her post this week on Simple Homemaking - A Return to My Roots. In it she talks about the book The American Frugal Housewife which I discovered you can get for free on your Kindle (and I did!). I started reading it last night and it is full of tips and encouragement. I also highly recommend Agrarian Nation for a look at the old agricultural writings written between 1825 and 1900. Also, jump on over to the Vintage Healthy Home Link-Up for some more encouragement! I am so into frugal~in fact, I tend to go natural as much as possible myself although we aren't farmers, but do have a small garden spot that we have increased every year! I've been getting ready to home can our produce which I did last year and it has been such a blessing this year! We have really enjoyed our tomatoes, applesauce, pickles and pears we put up. I hope to do more this year! I'd love to have chickens but we are in the city! LOL...Thanks for the reminders of all the healthy things that are of the past! I love the sweet pictures!